Guess What??? 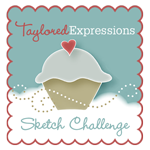 Today marks the first day of sneak peeks for the release of some “berry” special stamps at Taylored Expressions!!!! Woo-hoo! Today & tomorrow the Baker’s Dozen will be showing you some sneak peeks from the two new stamp sets, a new Key Ingredients Packet and some awesome favor treats/perfect package boxes – all of which will be available this coming Wednesday, August 5th!!! 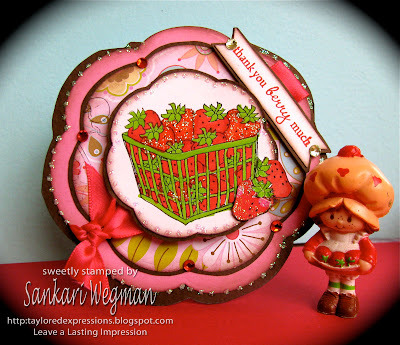 This first card is one of my favorite expressions: “Life is a Bowl of Cherries”– I used Taylor’s Friday Cupcake sketch #76 for this card and paper pieced the bowl of cherries from one of the papers in the Key Ingredients set (KI set). I paper pieced the cherries and flower and used my spellbinder dies to create the main focal point. 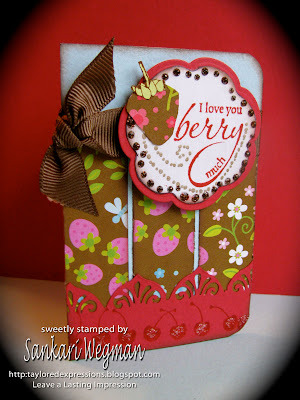 Card Details: Paper: All the papers are from the Berries and Cherries Key Ingredients set. Stamps: This set is called: Berries & Cherries Ink: Stazon-Black, Ruby Red from SU! Accessories: All the paper is from the Key Ingredients set, white gel pen, spellbinders Die, liquid pearls, and corner rounder for the scalloped edging. As soon as I saw these stamps, I knew immediately I wanted to create strawberry pincushions! 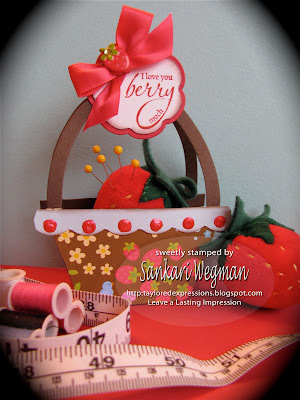 So, the last peek that I created is another berry card and this one coordinates with a little gift that I created: a basket with a strawberry pincushion. I found an easy template to make these pincushions on Martha (check out this link here) but I am neither nimble nor quick on the sewing machine – so I didn’t know how I was going to make it. But my dearest MIL came to the rescue and sewed up the edge of the strawberries. 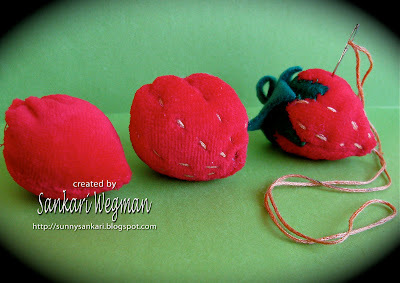 I then stuffed the strawberries, sewed it closed and then sewed the strawberry leaves on top with felt and fleece. And here is a picture of the card that I made for this gift set using the awesome Jen del Muro's Saturday Sketch from this last saturday: I paper pieced one of the stawberries in the set with some of the DP from the Berries and Cherries Key Ingredients set. 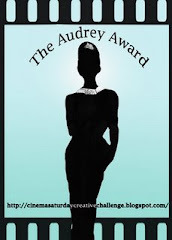 Thanks so much for visiting my little ole blog! Tomorrow we have some special sneak peeks of the other new stamp set that Taylor will be releasing and trust me – its going to be a part-aaay! So be sure to check back!!! Hope you have a berry special wonderful day!!! oh my HEAVENS, woman! these projects are over the TOP cute, I love the addition of Strawberry Shortcake for your display (I also used to love her). your basket & strawberry pin cushions are the SWEETEST EVER!! TFS your creative genius with us!! Sankari...these are gorgeous. And... is that a little Strawberry Shortcake Doll.... ooooohhhh I used to LOVE my little Strawberry Shortcake - I haven't seen one of those for AGES. All of these projects could not be more scrumptious! OH-MY-WORD! Where do you channel this amazing talent from? These are absolutely amazing! 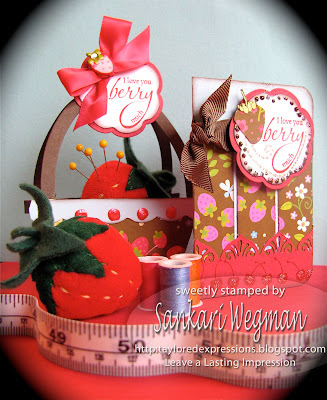 I'm always wowed by your projects and these little strawberries are too darn cute for words! O.M.G. I am not even sure what to say, except you ROCK girl! Ok...strawberry pincushions? NO WAY! I TOTALLY need to make one of those! EVERY single card and project is SO gorgeous...and you totally made me think back to my own childhood...I LOVED Strawberry Shortcake too! What was the name of the Blueberry one??? Amazing! Your cards are beautiful and that strawberry pin cushion is just over the top cute!! Wonderful sneak peeks!! WOW! These are beautiful and your photo editing is amazing! OMG Sankari, this is over the top amazing! Every creation is perfect and you show off this set to the max! I always love seeing your peeks...there's just so much amazement to take in!! Oh my goodness, you've been a busy little stamper...and everything is GORGEOUS, as always. I'm especially love love LOVIN' the strawberry pin cushions and favor box to hold them...SUUUUUUUPER SWEET!! WOW!! You blow me away every time! These are all AMAZING!! OMG Sankari!!! Everything is soooo fabulous I don't know where to begin!!! I love that you paper pieced the bowl in the bowl of cherries image and the idea to create a strawberry pin cushion...FAB!!! Where do you come up with these great ideas?!? You are outrageously talented - fabulous as always Sankari! Your craftsmanship is impeccable - just love it. Oh my!! What fabulous cards and pin cushions!! Each card is fabulous!!! Beautiful Beautiful work!! love evrything that you have made!! 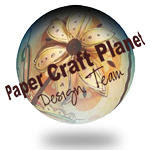 OMGosh, no wonder you have called your blog sunshine corner, it is so full of fun light inspiring projects, love them all! WOW! This just totally blows me away! You are one talented chica!! Could I just invite myself over and sit near you while you work your magic? Maybe some of your awesomeness would rub off on me!! All of your projects are absolutely fabulous! 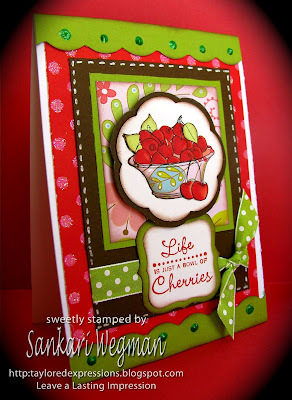 Love the cherries theme and your gorgeous colors...it all makes me smile! Oh wow, these berry creations are just stunning. You are truly creative. I'm with Donna... OH MY HEAVENS, woman!! That basket and strawberry pincushion project are absolutely amazing! I love your little vintage strawberry shortcake doll too... brings me right back to childhood! Thanks for all your hard work on these projects... you always amaze me! 2 Sketches 4 You - Laura's sketch #33 - Hi card! Holiday Challenge: Out of the A2 box! August Key Ingredients are here!!!! 2S4U #33 - What's Cooking? A Just Rite kind of Merry Christmas Blog Hop! Delicious Delights!!! Verve Stamps Sneak peeks!! School Days are almost here!